People often caution against putting all of your eggs in one basket. While this may be good advice, we’re glad not everyone follows it. In 2012, the owners of Burrito del Sol dropped everything and risked it all to open a food truck. The main attraction? You guessed it … burritos! But the story certainly doesn’t end there. The locals started craving these burritos at a rate that the old 1968 Airstream simply couldn’t handle. It was time for Burrito del Sol to find a more permanent location. 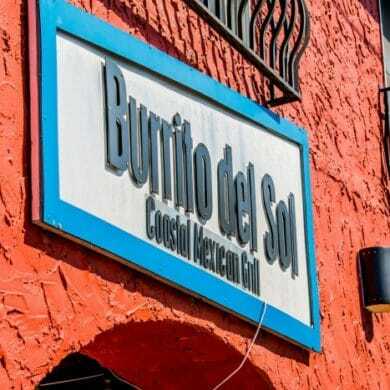 In 2013, the Burrito del Sol restaurant opened in Downtown Fort Walton Beach. Check your stress at the door. Burrito del Sol’s atmosphere is super laid back with lots of local art on the walls. If the sun is shining and you prefer a breeze, there are plenty of places to sit outside. At Burrito del Sol, you get to call the shots. Want a burrito loaded with steak? Done. Want cheesy nachos topped with fresh Gulf shrimp? Say no more! Picking a protein is just half of the fun at Burrito del Sol. You will also get to choose whether you want your meal Baja, Chipotle, Southwest or BBQ style. If you’re unsure, the friendly employees are always happy to recommend a style that will best suit your desires. As with most restaurants, there is some controversy amongst the locals about which menu item is the all-time best. But time and time again, we keep hearing an overwhelming number of supporters for the Baja fish tacos. The warm soft-shell tortillas, fresh catch Gulf fish and sweet pineapple salsa in the Baja blend creates an explosion of fresh coastal flavors that will leave you in Florida-Mex bliss. Don’t even think about taking a bite without getting some of Burrito del Sol’s freshly made mango habanero sauce. Don’t let the habanero intimidate you, because this delicious sauce is way more sweet than heat and is sure to elevate your Burrito del Sol experience to the next level. Ask about beer by the bottle or tap and frozen margaritas for those extra hot summer days. Burrito del Sol is located at 201 Miracle Strip Pkwy SE B in Fort Walton Beach FL. For more information or to look at a menu, visit the Burrito del Sol website or call (850) 226-8016.